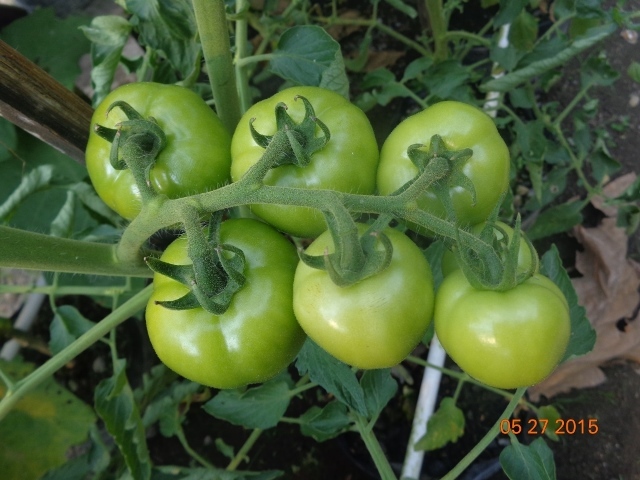 Tomato originated (Lycopersicon esculentum L.) from Central and South America. Typically it is grown at the elevation of 0-1500 m. Conventional and polybag farming is the most common way to grow this plant. However, it can now be also cultivated in hydroponically. Hydroponic farming can be performed on any medium and equipment. But the only part that has to be precise is the nutrients. In other words, nutrient solutions for a hydroponic system have to be precisely measured to achieve optimal harvests. Hydroponic nutrients usually come in two salt mixtures, labelled A and B. These salt mixtures are usually dissolve in water to make to concetrated solutions separately to avoid salt sedimentation. These solutions then are further diluted to make the working nutrients. Follow the instructions from the manufacturers to avoid wasting the nutrients. Nutrient A solution consists of Calcium Nitrate (Ca(NO3)2), Potassium Nitrate (KNO3) and Iron-EDTA (FeEDTA). Nutrient B comprises Potassium Dihydrogen Phospate (KH2PO4), Ammonium Sulfate (NH4)2SO4, Magnesium Sulfate (MgSO4), Copper Sulfate (CuSO4), Zinc Sulfate (ZnSO4), Boric Acid (H3BO3), Manganese Sulfate (MnSO4) and Sodium Molibdate (NaMo). These solutions are available at many online vendors and some farming supply stores. The growing medium consists of rice husk charcoal and coco peat in 2:1 ratio. The medium should be soaked in a disinfectant solution for one day and dried prior to use. To prepare the seedlings for hydroponics, soak seeds in water containing liquid organic fertilizer for 12 hours. With our liquid organic fertilizer, SNN, the working solution for this step is two milliliter (2 cc) of SNN in one liter of water. Keep only seeds that sink to the bottom. Then placed the seeds on a piece of wet tissue until they sprout. This usually takes about three days. Place the sprouts on the sowing tray containing a growing medium. Keep it moist with the hydroponic working solution. Move the healthy seedlings to the growing containers 10-14 days after sowing.The containers can be 22-cm polybags and one seedling per bag. The nutrient is supplied to the containers using a 2-m pump. We can irrigate up to 50 bags of plants with this pump. Tomatoes are irrigated twice a day in the first month, with a duration of one minute per session. From one month to harvest, irrigation frequency alternates each day; twice in one day followed by three times the next day, then going back to twice a day, then three times, and so on. Monitor the moisture in the medium and adjust the irrigation frequency and duration accordingly; increase irrigation when the medium is too dry, and reduce irrigation when the medium is too wet. Harvest usually starts three months after planting and happens every three days. The right time harvest is in the morning and afternoon when the temperature is cool. Pick the fruits with the vines. Tomatoes are highly perishable and should be marketed immediately. Sorting can be done based on colors and sizes.